If you come from Tuscany or Parma, leave the motorway at the tollgate of La Spezia. On the ring road you reach the town. Go along the sea, and take the SS AURELIA towards GENOVA. After having left a tunnel behind, turn left towards Sestri and Riccò del Golfo, take the first street on the left towards Castè, and follow the road signs for CASTE'. 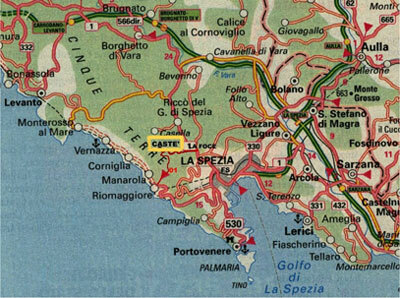 If you come from Genova, leave the motorway at the tollgate of BRUGNATO, and go towards La Spezia. Leave the villages PADIVARMA and RICCO' DEL GOLFO behind, and immediately after the village SAN BENDETTO, turn right at the road sign "Campo Sportivo" (sports field), and follow the road signs for CASTE'. Castè is a very small medieval village of the region Liguria's hinterland, at the edge of the Park of the Cinque Terre. The small village dates back to the 15th century, and it is very close to the sea and the town La Spezia. The Cinque Terre can be easily reached by car, by train, by sea. Trekking fans can walk along the trail 01 which crosses Castè. From La Spezia you can easily reach by sea the most beautiful places of the Ligurian Riviera (Lerici, Tellaro, San Terenzo, Fiascherino, Portovenere and the island Palmaria). CHECK-OUT : within 10 a.m. The prices are comprehensive of the linen from room and bath. If the night's passing is advanced to the week is provided to the change of the linen and the towels, without costs added to you.